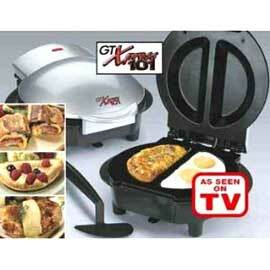 GT Xpress 101™ cooks delicious meals fast and without the added fat! With GT Xpress 101™, all you do is place food in the preheated cooking wells and close the lid. The dual cooking wells and controlled temperature cook from both top and bottom at once so there’s no turning or burning. GT Xpress’s thermostat controls the temperature so you get perfect results every time - even if you leave it in too long! The hinged lid prevents spillovers and clean up’s a cinch too, just wipe with a damp cloth. Enjoy healthy, flavor-packed, satisfying food in no time! 101 Recipe book includes meal, snack, dessert and low carb recipes.